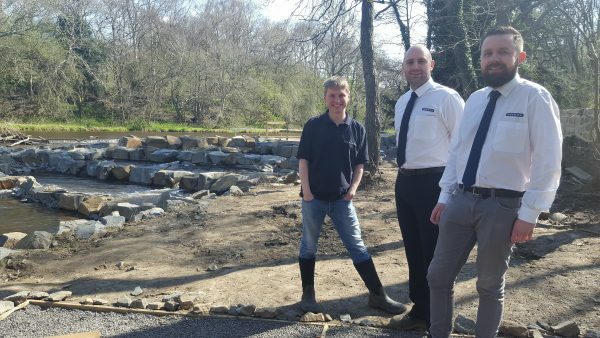 Leading temporary works specialist, Mabey Hire, teamed up with Tyne Rivers Trust to ensure that an internationally important project to build a fish pass at Shotley Bridge, County Durham went ahead. Mabey Hire’s Durham depot supplied 450 metres of temporary roadway – known as TuffTrak® mats – at a discounted rate so that vehicles delivering equipment and materials including 1,000 tonnes of stone could access the site without damaging agricultural land. The Tyne Rivers Trust project to build a fish pass at Shotley Bridge which is now complete aims to improve fish populations on the river Derwent by enabling a range of species such as lamprey, eels, grayling, brown trout, sea trout and salmon to move up and down the river for the first time since the weir was built 300 years ago to power a mill. Jack Bloomer, Project manager at Tyne Rivers Trust says: “Gaining good access to a site is often one of the most difficult and time-consuming parts of a project for the Trust. The Tyne Rivers Trust project is the final piece in the jigsaw for enabling fish movement on the River Derwent following fish passes at Derwenthaugh and Lintzford which have already proved a success with a greater diversity and density of fish species now found upstream of those sites.